Guys. This was a great week. A fantastic week, really. I am practically giddy when I think about it. Not that any weeks have been particularly bad leading up to this point. Just more on the discouraging side from a running perspective. It’s been hard to move beyond that. I keep looking for the silver linings and the bright sides, because that’s what I do best, but some days, when I lace up those shoes, I have been faking the heck out of it. I’m feeling calm and back in control, which is how I like to be. Let’s hope I can keep it going! After our night on the town, we got up before the sun for the Evergreen Pumpkin Run 10 Miler. This race takes place in the Evergreen Cemetery and was touted as fast and flat. I was actually really intimidated because of some of 2013’s finish times, but Mr PugRunner and I were committed. I will post a full recap this week – I loved it, while he struggled a bit. It was great practice for him, though – he’s got his first half marathon coming up and being in that longer race environment was something he needed. We zipped back to the hotel, showered and then went right back out to the Dolphins @ Jaguars game. While I do love the Jags, the Miami Dolphins are my favorites, and it was nice to get to see them live. The Fins did end up taking the victory, but it wasn’t a great experience. For some reason, the fans on both sides were really touchy and as the game progressed, tempers were high. We ended up cutting out early because of it, but I was disappointed that it turned out that way. I still wanted to get in some miles, in the hopes that since I would be within the 24 hours since I started that 10 miler, it would count towards a long run. And I was also miserably behind on the Virtual Pug 10K for which I had registered. That sweet pugicorn medal was still wrapped up in its shipping envelope, waiting for me to log 6.2 miles and earn it, and fortunately, I had a great reason when my friend in the next neighborhood asked me if I would do a long run with her. I was happy to oblige, and we got it done. I laid low on Tuesday, because we had big plans that night. Little man is part of the Jaguars Kids’ Club and was able to go for a “Trunk or Treat” at Everbank Field. It was super cute – the kids wore their costumes and we got to trick or treat through the stadium and then enjoy a DJ and light dinner in the Touchdown Club. So fun and it was really neat to get that behind the scenes view. Mr PugRunner and I have been going back and forth over our training runs, and so this was another day I just didn’t make it out. I was ok with that. I LOVE these socks so much, and I am always thrilled to add to my collection. Thank you! In the morning, I had to volunteer at school, and then it was off on tons of errands to get ready for Halloween. Little man had a ball game that night and I had to get as much done prior to leaving as I could. About 20 minutes before game time, a thunder storm whipped in. It wasn’t really doing more than drizzling, but the lightning started, and even though the officials tried to delay the game, the weather wasn’t clearing. Confession: I was glad to get out of there. Every delay pushed bedtime back later and later, and I wanted little man in top form for his spelling test and trick or treating. Even though I had a ton of stuff to accomplish today, I popped up at 5:00 AM, put on my “Evil Fairy” tank from Raw Threads and hit the road. 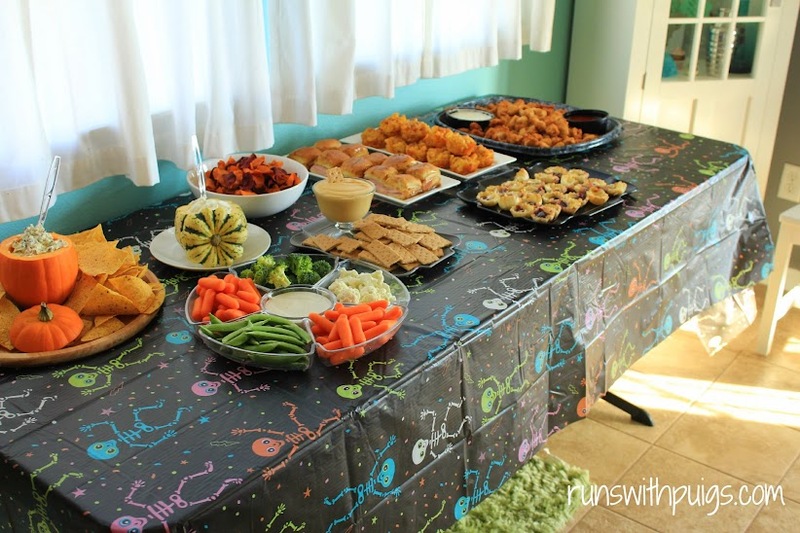 I couldn’t rejoice for too long – I had to go help out at little man’s school party and then home to set up for our pre-trick-or-treating dinner. Harry Potter was ready to go! We stayed up way too late with s’mores around the fire. And good friends. And wine. It was a lovely evening. Waking up was kind of hard, especially because the temperatures absolutely plummeted and a nasty wind kicked up. Little man had another game, and we packed a picnic from leftover party food so we could eat at the ballpark. It. Was. Freezing! I couldn’t even feel my toes! However, the cold temps seemed to perk all the kids up, and they won! 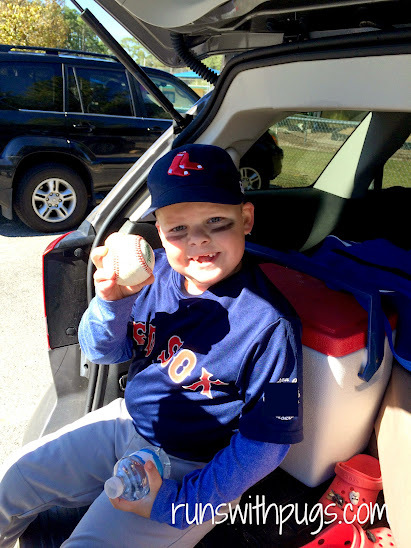 We were incredibly proud of little man: he has been struggling with the transition from coach pitch to machine pitch. With practices and coaching, he has finally been making serious contact, and on Saturday, he got his first base hit and his first RBI! It was awesome. Coach even gave him the game ball for his tireless efforts and that was so great. We spent the rest of the day with family, having a lovely dinner to celebrate our upcoming anniversary. And then it was home to take advantage of Daylight Saving Times! I love falling back and “gaining” that extra hour! As you can see, everything is awesome! October was wonderful! I hit 60 miles for the month, which I haven’t done since July, and I have logged 1000 miles since I started running last year! Holy. Moly. I feel stronger and faster and ready for Space Coast. I don’t know if that means I’m ready for the marathon, but my head is in a much better place than it was a few weeks ago. My goals for November and December are pretty simple. 1. Stay healthy. That’s it. I just need to eat well and keep in tune with my body. 2. Be consistent. No matter how much the longer runs intimidate me, I’m going to get out there and put in those miles. The change of season makes it easier, and I have, with some great advice and support from some readers and real life friends, decided to give myself a bit of a break in my training. My plan had me going all the way up to 26 miles, and while, mentally, I feel I need those miles, I also don’t want to get hurt or sick or show up to that marathon starting line in bad shape. I guess time will tell if I’m making a wise decision. 3. ENJOY! Everything is going so well and I need to revel in that. How was your week? Your month? What goals do you have set for November or for the rest of the year? Congrats on a great week! I was a total slacker. I had planned to run 5 or so this weekend, but the weather was miserable. Cold, rainy, and windy Saturday, and Sunday we had wind gusts up to 40 MPH. I live in a heavily wooded area, and have fears of death by fallen tree. Maybe I’ll get out there tomorrow morning… maybe. I’m impressed you got so many miles in with all of the other fun events going on! Little man makes a great Harry Potter! My horse Rio has a lightning bold on his face, so i stuck some paper glasses to his head and called him Harry Potter for Halloween too. I’ll post some pics on the blog tomorrow. I’m so glad you’re getting your confidence back! And it’s true, you don’t have to go the full 26 before race day. You’re going to be great! We are so in sync with our Harry Potter theme! How cute! Can’t wait to see that photo! I know people SAY it’s true, but it doesn’t FEEL true. Ugh. Not knowing for sure is so hard!